I like Santa, but let's face it. We need an upgrade. A Contemporary Santa model doesn't exist. He can't possibly still be making wooden toys in the North Pole. We should get him a barge to China, and a GPS for his sled, to navigate his way to some of the big factories over there. All that reindeer meat is bad for his heart, he would do well to start juicing and exercising. By the way, who speaks for the Elves? Someone needs to help them form a Union. He is working those little people to death in freezing factories, and drafty warehouses. Recently I came to the realization that Santa has a brother. His name is Satan. It all started when I noticed they both share the same letters in their names. S.a.t.a.n lives way, way, down south, and is skinny. Satan wears a red body suit. Satan’s is black, menacing and pointy. 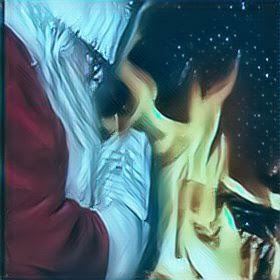 Santa, (St. Nick), has saintly origins, A benevolent sort. Satan lived in heaven too, until he was thrown out for being a spoiler. Santa comes down the chimney and gets ashes on his boot soles. Satan dances with bare feet on the ashes of burnt souls. Santa carries a white gift-sack and is a GOOD guy, and brings us stuff when we are GOOD so we aren't tempted to be BAD. Satan, carries a black fork, and is a BAD guy, and pokes us with the fork when we are BAD, but that actually motivates us to be GOOD, so we don’t fry in the end. As immortals, they motivate us with supernatural powers. Rewarding or punishing us according to our behaviors. In a sense they encourage our conflicted beliefs as mortals keeping us fearful, needy, and somewhat disempowered. I read somewhere that Santa emerged in his red suit from a coca cola advertisement in the 30s. The downside of that is that there isn't much reference to God or Jesus in the selling of Coke or The sponsorship of Malls where fake Santas pose with expectant, confused and crying children. Satan, on the other hand, has been around even longer. God tossed him down to earth for filling humankind with fear and hate. The upside of that is that we found a savior, God's son, Jesus, to help us. The downside is we’ve created Christmas, a 30-day birthday party for him where we get the goods. Our original good intentions have evolved into seeking for more material objects which have been culminating in the eventual wasting of the planet. have always been our true nature. Satan should consider moving to the North to live with his half-brother Santa, where they could have a reunion of sorts. Satan would teach Santa the benefits of exercise, and design plans to build a big furnace to heat the warehouses. Santa, in turn, would give Satan a pair of fireproof gloves, and a large knife and spoon to use with his big fork. Mrs. Santa would prepare a vegetarian Christmas dinner and invite the elves over for a big party where they will finally receive their Christmas bonuses for all their hard work. Tonight is Christmas Eve. The tree is lit, and I’m sitting at my fireplace. The music is playing, “I saw Mommy kissing Santa Claus,” and I’m thinking, Satan deserves a kiss too. He provides the coal for the stockings of us naughty people. 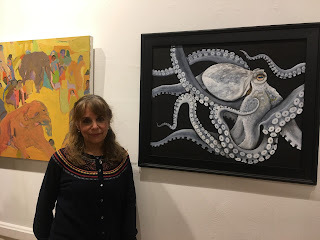 Cecilia with her painting, "Spirit of the Octopus."